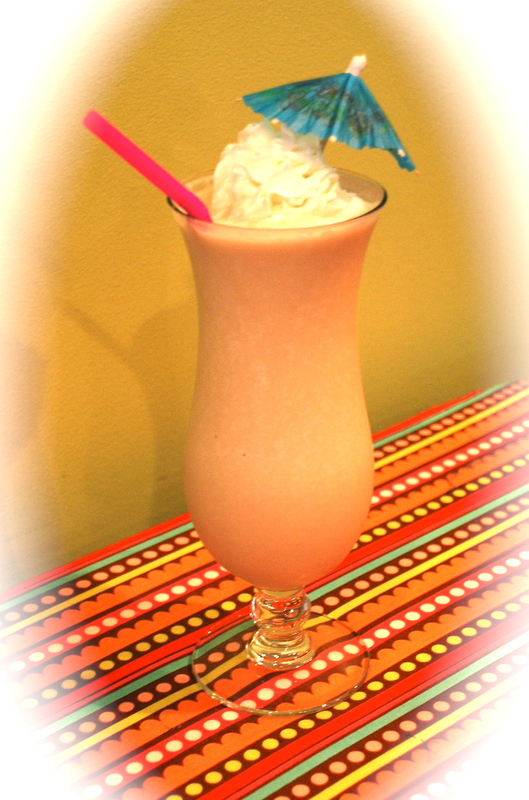 In a blender combine the cream of coconut, coffee liqueur, light rum, creme de cacao, ice cream and ice. Blend until smooth. Pour into two large glasses and garnish with a cherry, and if you are feeling, brave top each glass with a shot of 151. Is all this talk about sewing making anybody out there hungry? Well, I’ve got the perfect fix for that — these delicious tacos stuffed with honey and cumin glazed crispy fried fish and spicy chipotle slaw. Mr. Homemaker and I enjoy making these tacos together when we have a little extra time to spend together in the kitchen, usually on a weekend afternoon. With a little preplanning you could definitely turn this into a weeknight meal as well though. We discovered these tasty treats a few years ago and have shared the addiction with many of our friends and family since then. 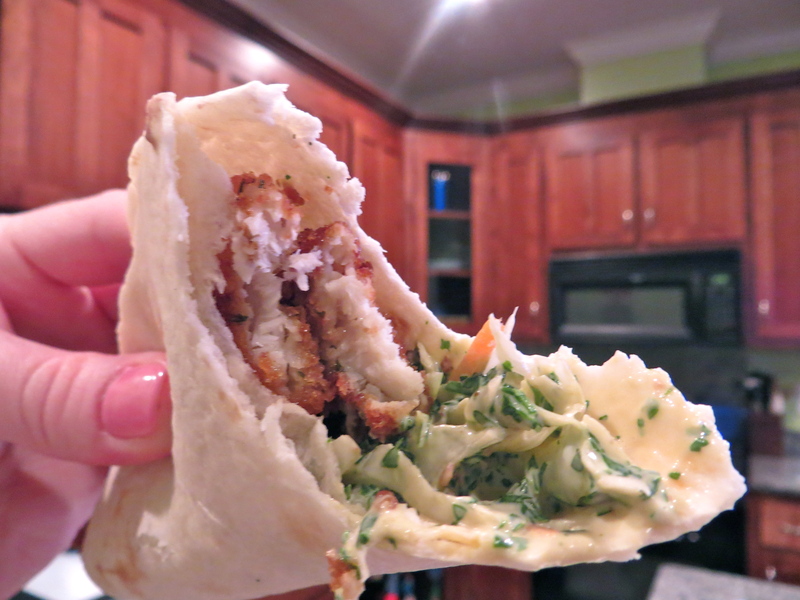 While the recipe calls for tilapia, you can substitute any mild white fish you have on hand. For this batch, we used some red snapper from our deep freeze that was caught by yours truly last summer. We have also made them with the day’s fresh catch of bass and bream from the family pond. Either way they are delicious. One word of caution, the original recipe, linked here, calls for way more chipotles in adobo than we think is necessary (and we aren’t wimps about spice). I have modified the recipe I am presenting here but if you are sensitive to heat, please start with 1/2 or 1/3 the amount of chipotle paste and increase it to taste. It is some pretty spicy stuff! So gather round your favorite peeps, whip up a batch of refreshing drinks (maybe some of these), and have a fish taco fiesta soon! *I take a whole jar of chipotles in adobo sauce and puree it in the food processor. I then transfer the puree to a resealable container and keep it in the fridge to use as needed. Meanwhile, make the honey-cumin sauce by whisking together 1/3 cup lime juice, honey, vegetable oil, and ground cumin a small bowl. Set aside until needed. To make the chipotle mayonnaise dressing, whisk together the mayonnaise, pureed chipotle sauce, 1/4 teaspoon salt, and cayenne pepper. Cover, and refrigerate until needed. 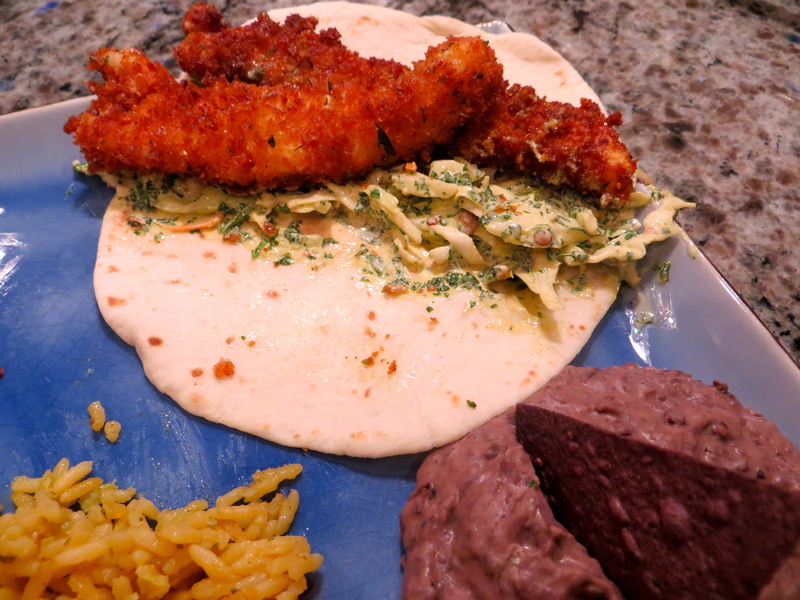 To bread the fish, place the flour, eggs, and panko crumbs in three separate shallow dishes. Season the fish with salt and pepper to taste. Dip the fish pieces first in the four, coating evenly, and shaking off any excess. Dip next in the eggs, and last in the panko crumbs, patting the pieces to help the breadcrumbs hold. Set the fish aside on a plate. To cook the breaded fish, pour 1 cup vegetable oil into a skillet to 1/4 inch deep. Heat the oil to 365 degrees F (185 degrees C) over medium heat. Cook the fish, turning until all sides are golden brown, and flesh is easily flaked with a fork. Drain on paper towels. Brush the fish with the honey-cumin sauce. Mix the coleslaw and cilantro together in a bowl. Reserve 1/4 cup of the chipotle mayonnaise dressing, and pour the remaining dressing over the coleslaw mixture. Toss to coat evenly with the dressing. Place the tortillas on a flat surface, and spread each with a little bit of reserved chipotle mayonnaise dressing. 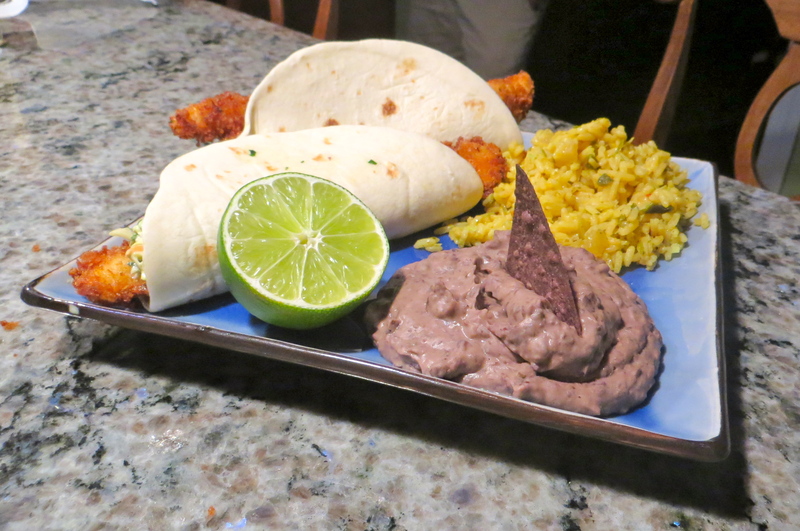 Divide the fish between the tortillas. Top with the cilantro coleslaw. 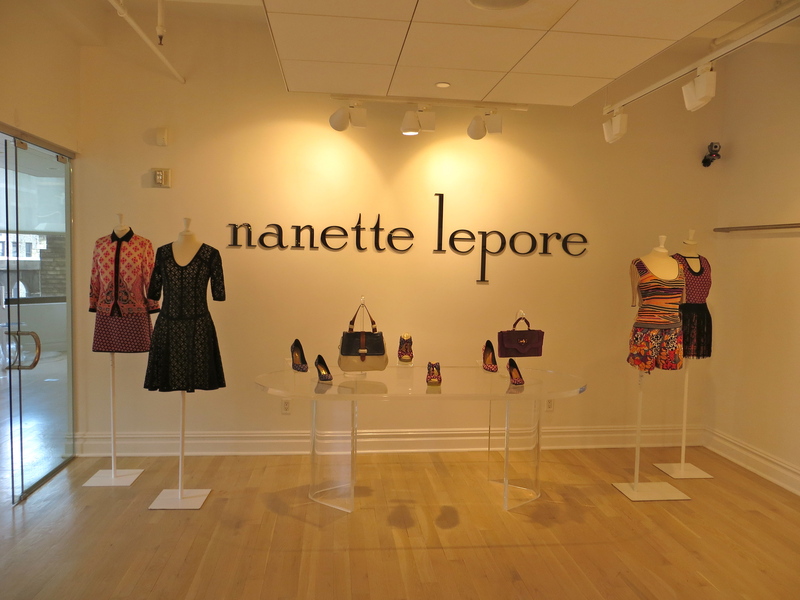 Me at Nanette Lepore showroom, standing in front of the upcoming season. Of course I’m blocking the whole section of NL clothes that match the shirt I’m wearing. 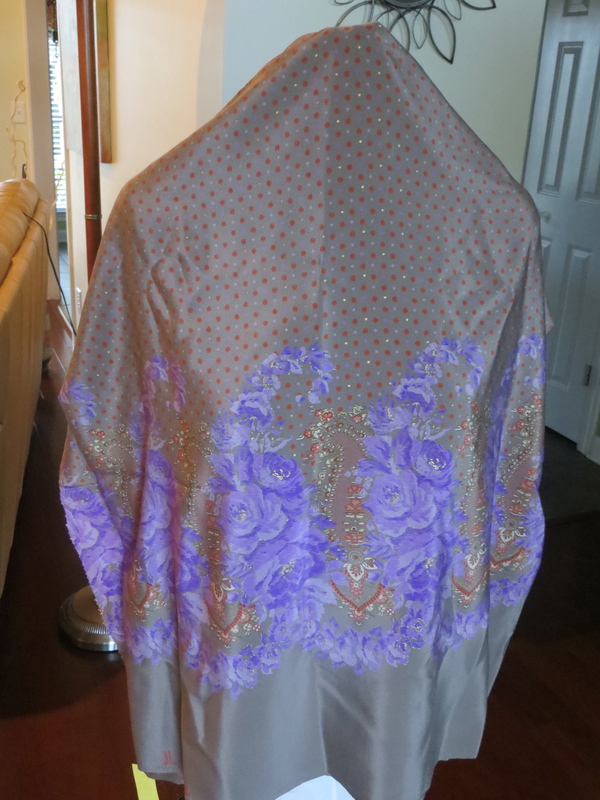 This is my second attempt at Sewaholic Cambie. 1. 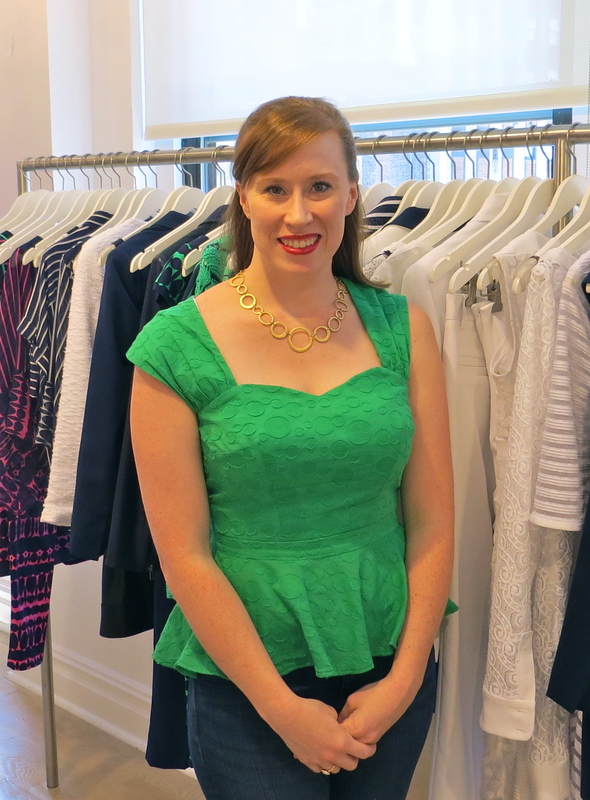 The sweetheart neckline doesn’t hug the body very well. 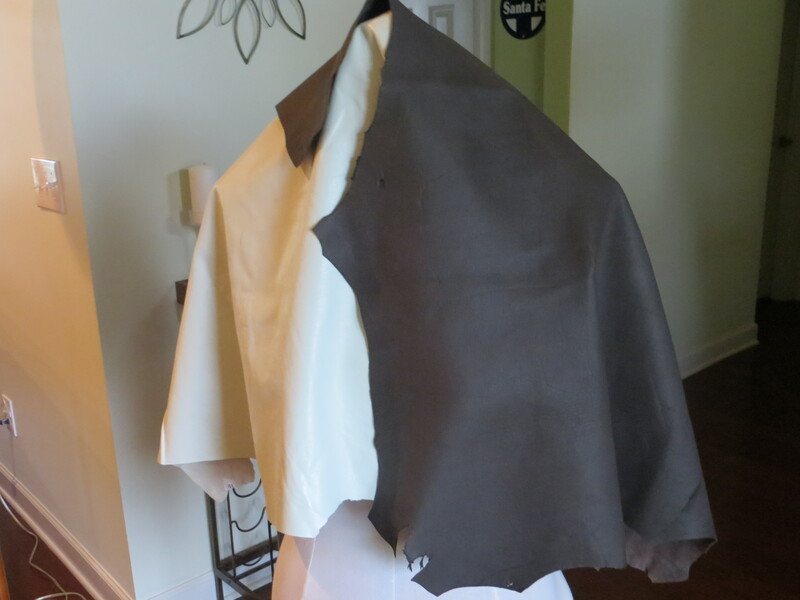 I understitched the lining to the seam allowance and this helped a little but on my next version (currently in the works), I am going to ease in a slightly shorter piece of twill tape to the seam allowance to get the neckline to hug my body better. 2. Along the same lines, the instructions tell you to trim the seam allowances of the neckline before you insert the sleeves. This makes it a little trickier to know exactly how far to pull the sleeves through before sewing. Next time I will just wait to trim everything after I have pulled the sleeves through and sewn them in place. So I started with a pattern size 8 and made the slashes up and across according to the Fit for Real People book. Since the pattern doesn’t have a side seam dart, I created one for better shaping. According to my DD cup size (I can’t believe I just said that! ), I needed to add 1″ between the vertical lines of the slash I made, opening up the waistline dart wider. I trued up the length of the bottom of the bodice piece, made sure my bust point was still accurate, drew in my dart legs (kept the waist dart curved with my French curve ruler), and I was done. I have to say, this is the best fitting bodice I have ever sewn! Yay!!! 4. 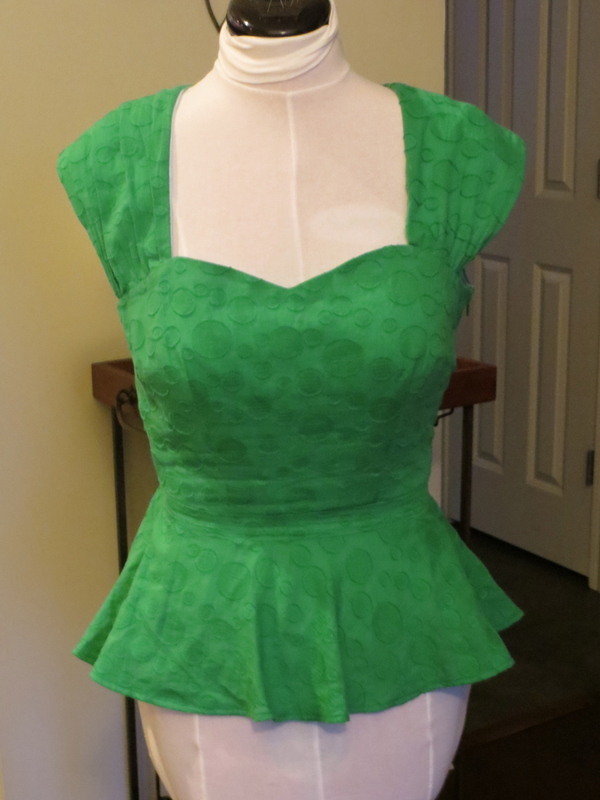 Since I modified the dress in to a blouse and swapped out the two pattern skirt options for a peplum, I had to draft this myself. 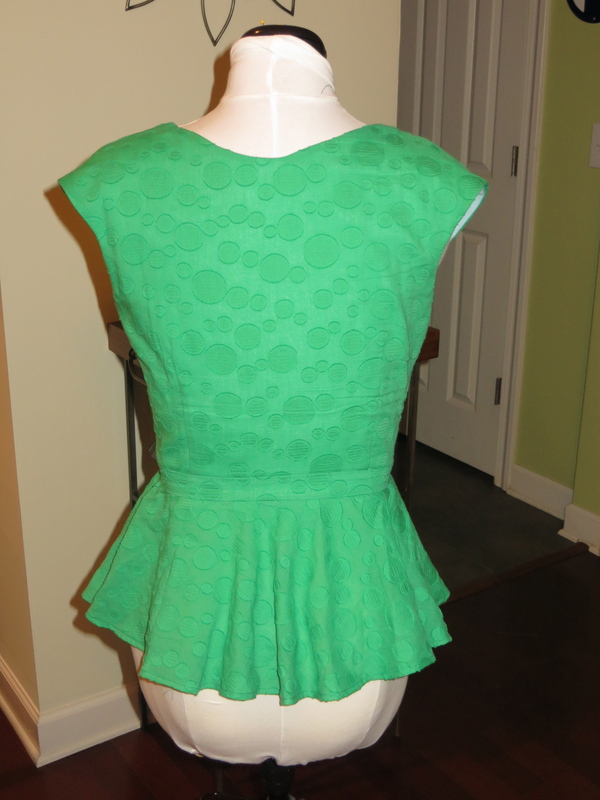 No worries, though, because drafting a small full-circle peplum is pretty simple. 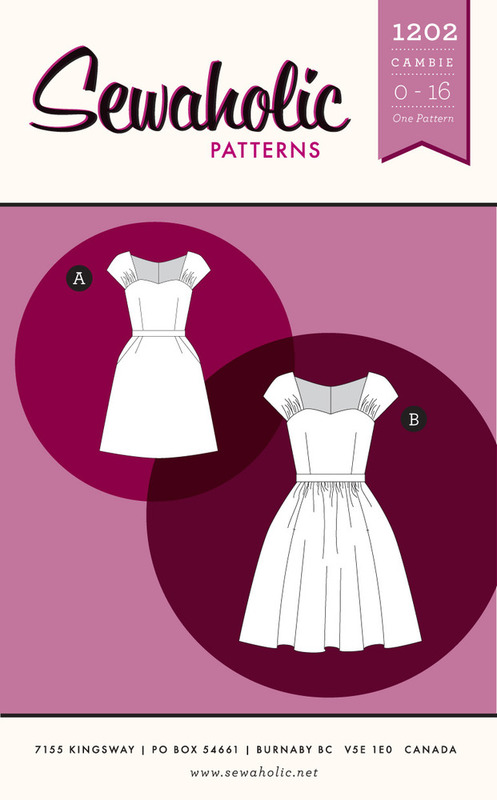 Just google “drafting a full circle skirt” and you will find plenty of great tutorials on how to do it. 5. I moved the zipper from the center back to the left side seam. 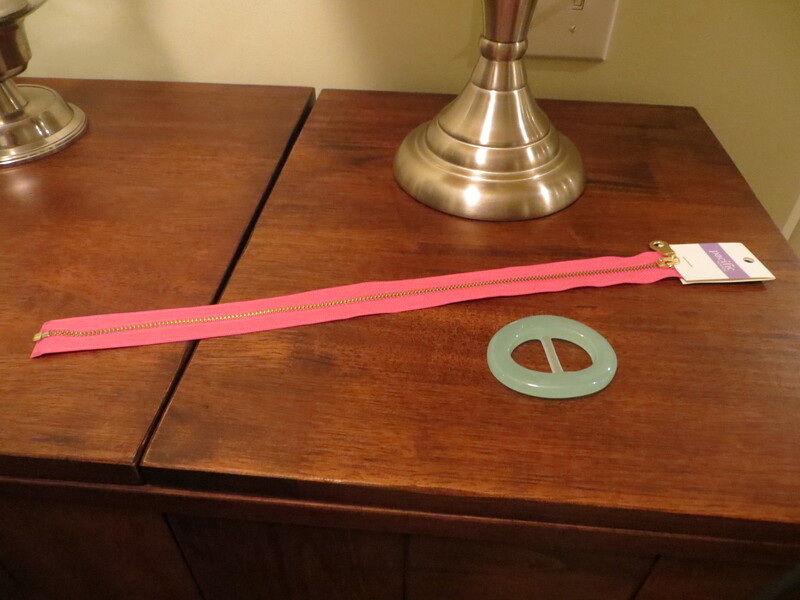 Tasia gives great instructions on her blog about how to sew the lining to the invisible zipper. I will be using this technique from now on. It is so professional and clean and I didn’t even need to sew in a hook at the top of the zip! 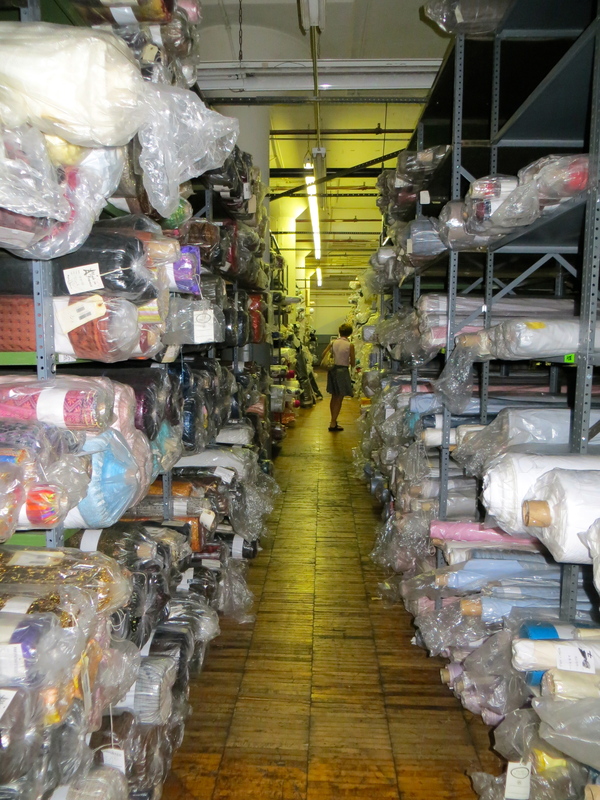 NYC #2 — The Fabric!!! This is a silk border print that I got 3 yards of. Definitely seeing a dress in its future. On the left a silky soft cotton floral print (3 yards) and on the right an equally soft and shiny royal blue cotton sateen (2 yards). On the left a free remnant of some abstract print. 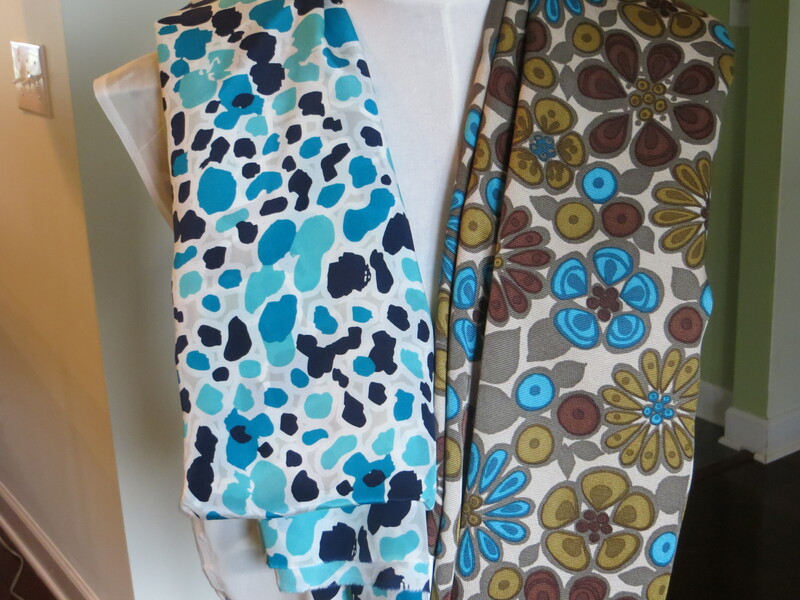 On the right a gorgeous silk woven with a little stretch and some texture (3 yards). 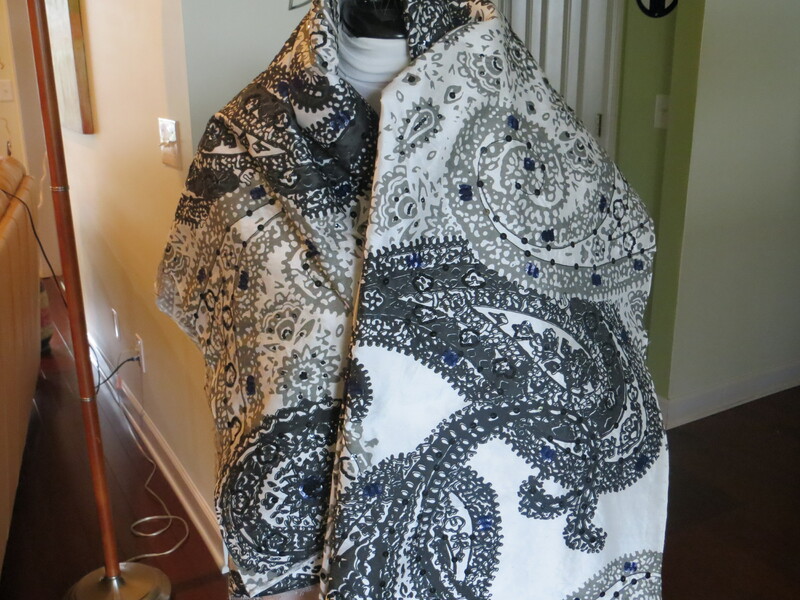 This is one of my favorite finds — a silk Shantung or dupioni with grey and black large-scale paisley print and bright navy blue sequin embellishments. 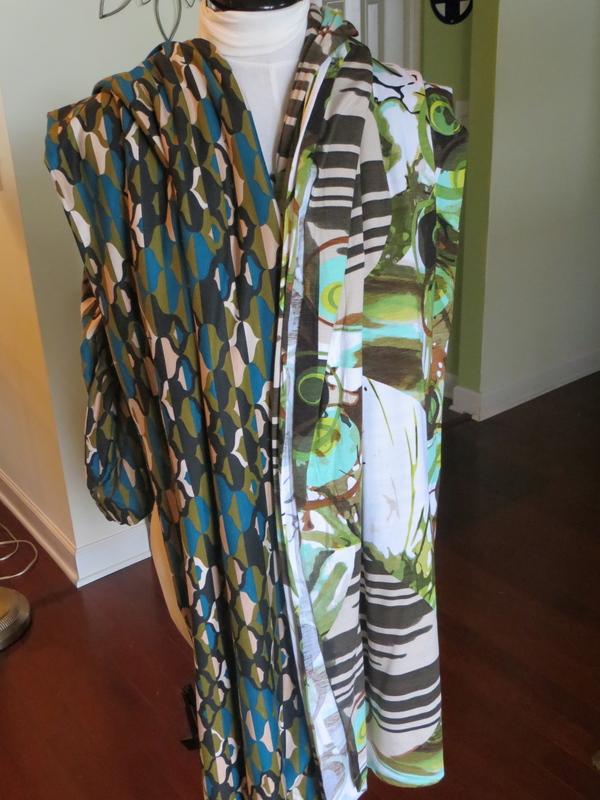 Perhaps a dress and/or blouse if I can squeeze it out of the three yards I bought. 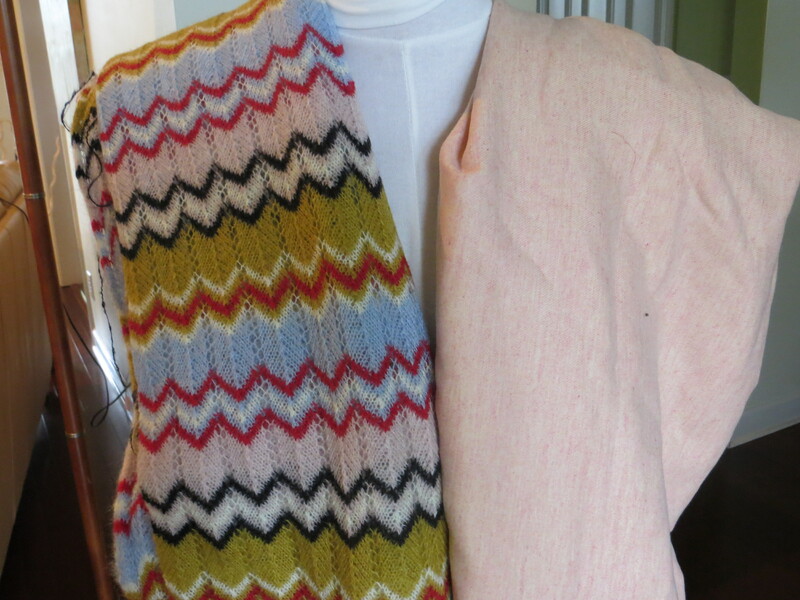 On the left a Missoni sweater knit remnant I got for $40 (about 2.5 yards), and on the right 1.5 yards of cashmere and linen blend for a sweater with an exposed hot pink zipper up the back (zipper coming up soon). Both knits, on the left a more stable piece with chocolate brown, aqua, tan, and white; on the right, a jersey with olive green, aqua, brown, and white. Knit top from the piece on the left and maybe a DVF-style wrap dress from the piece on the right. 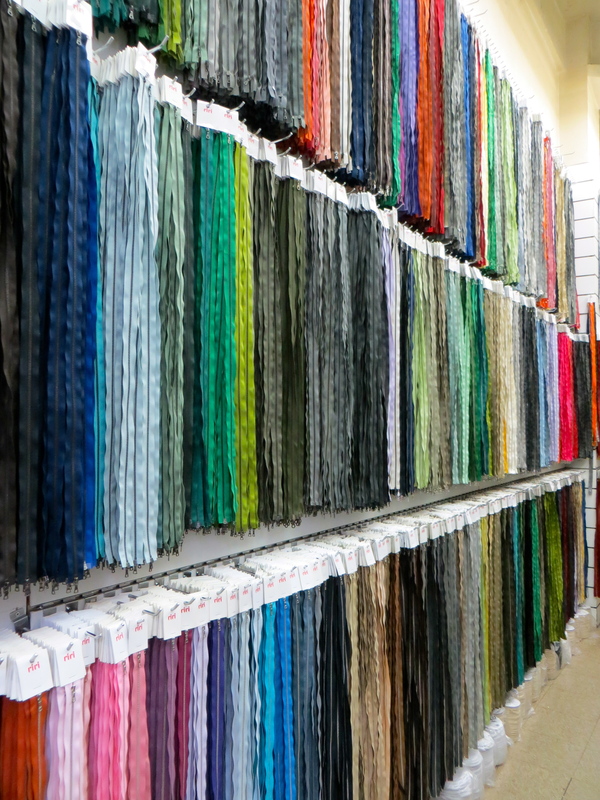 3 yards of each. On the left, one yard of a gorgeous black woven fabric with texture and sheen, destined to become a LBD or pencil skirt for dressier occasions. 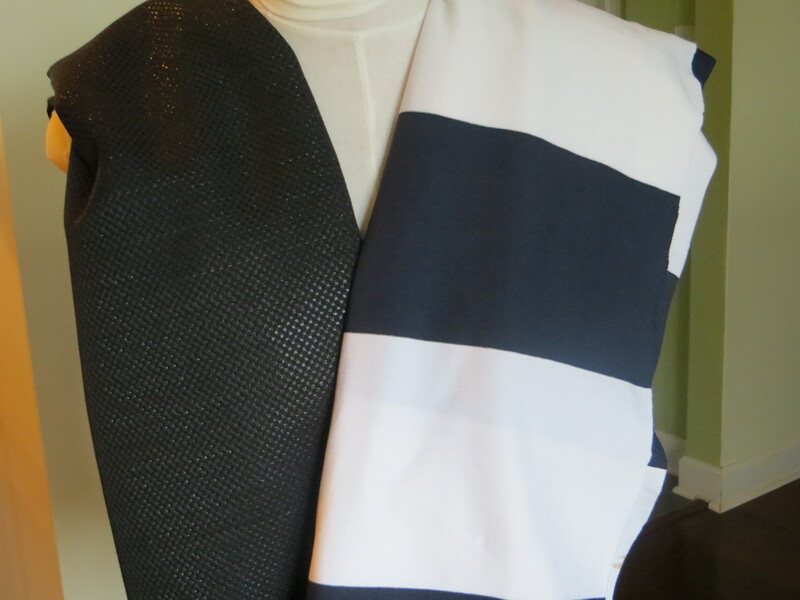 On the right, 4 yards of a wide navy and white stripe knit for a maxi skirt. 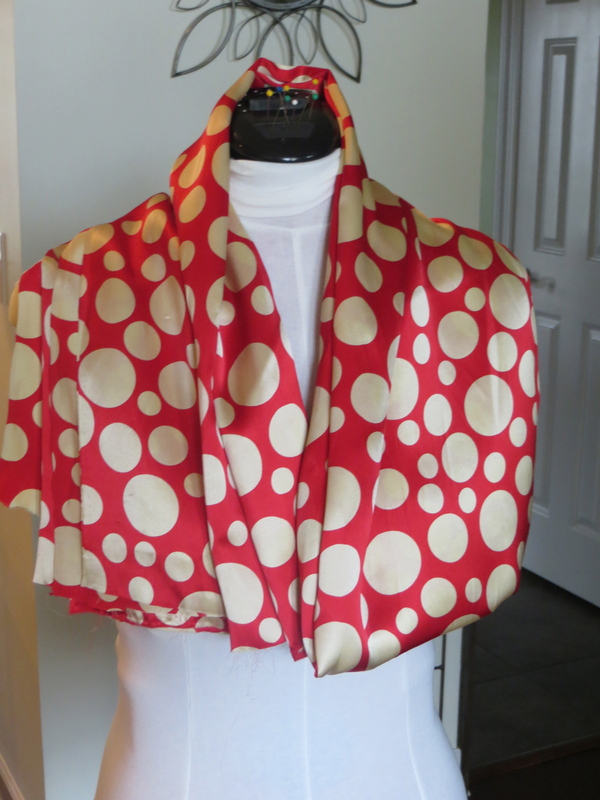 On the left, tan dot silk jersey with plans to become a tie neck blouse. 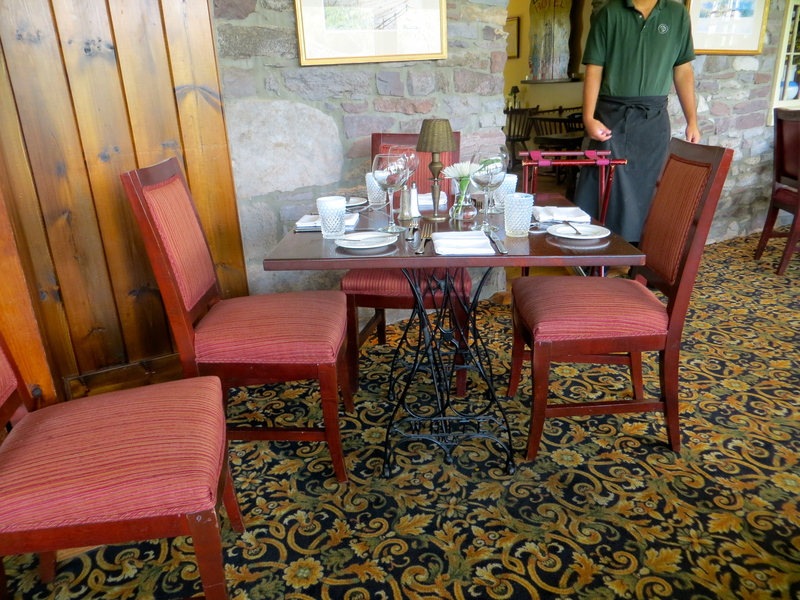 On the right, a fine rib knit in soft green with aqua, burgundy, and olive green — one of my favorites. Three yards each. 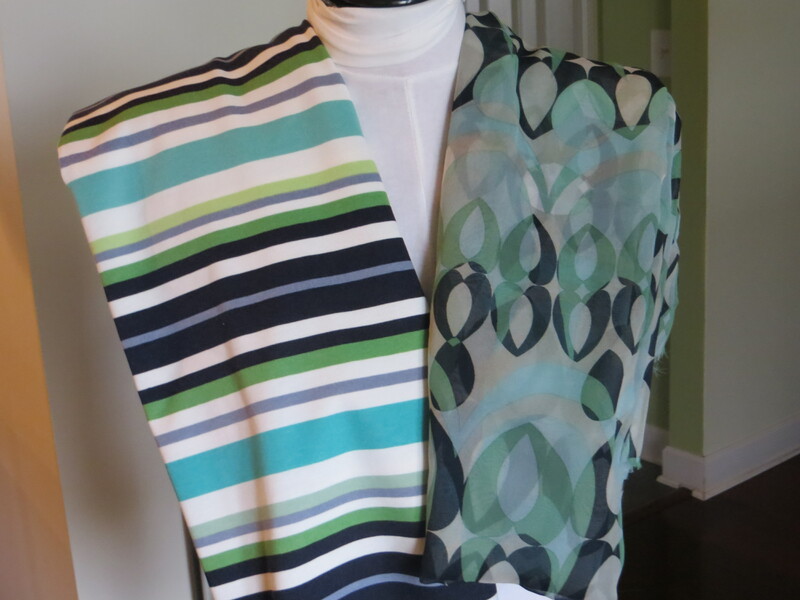 On the left, a ponte knit stripe with plans to become an easy to wear dress. 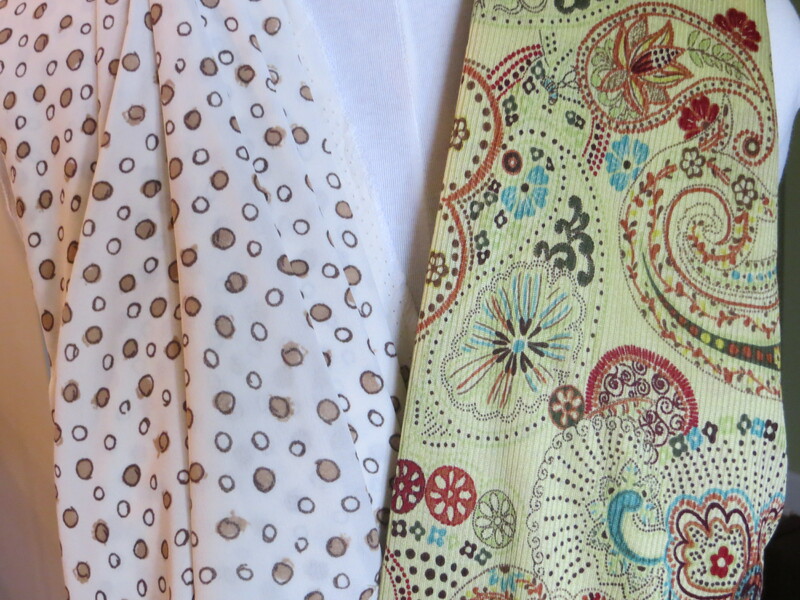 On the right, a beautiful, light silk chiffon. 2.5 yards of the left, 2 yards of the right. 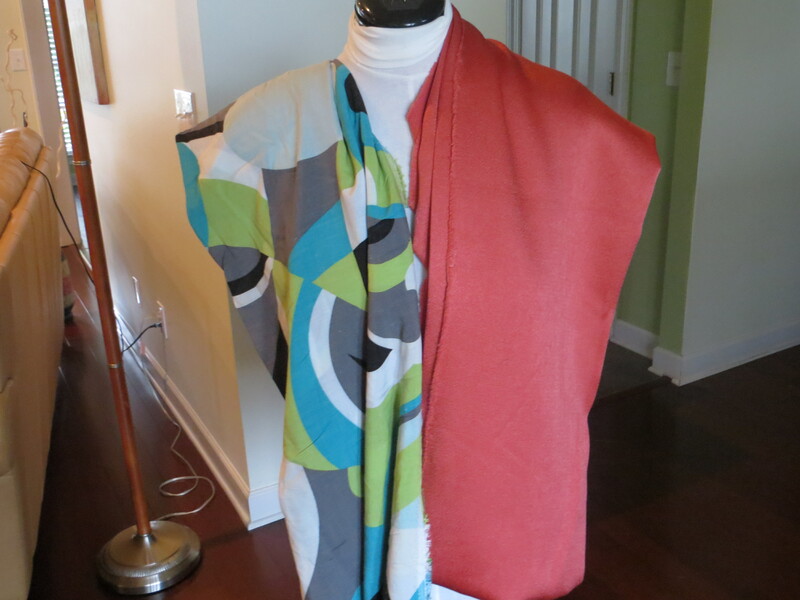 On the left, a silk voile with no specific plans yet. 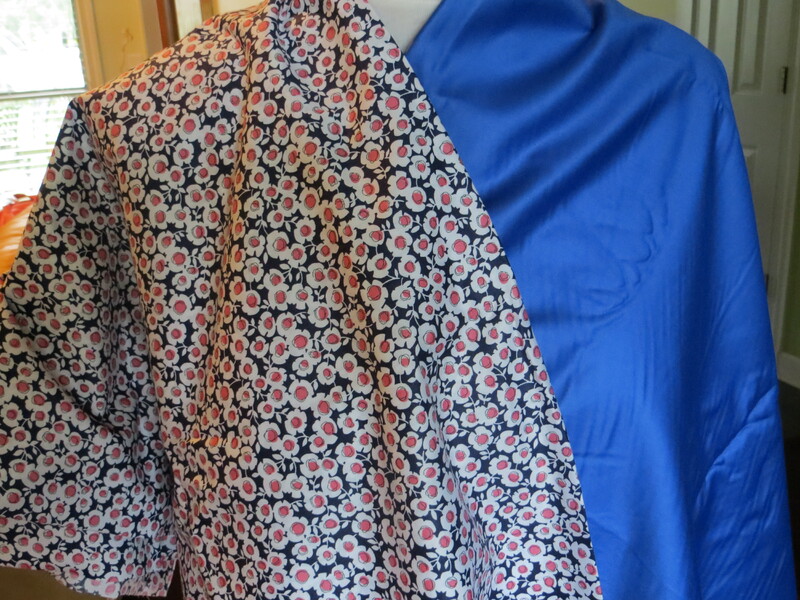 On the right, a pretty silk twill with dress plans. Three yards each. 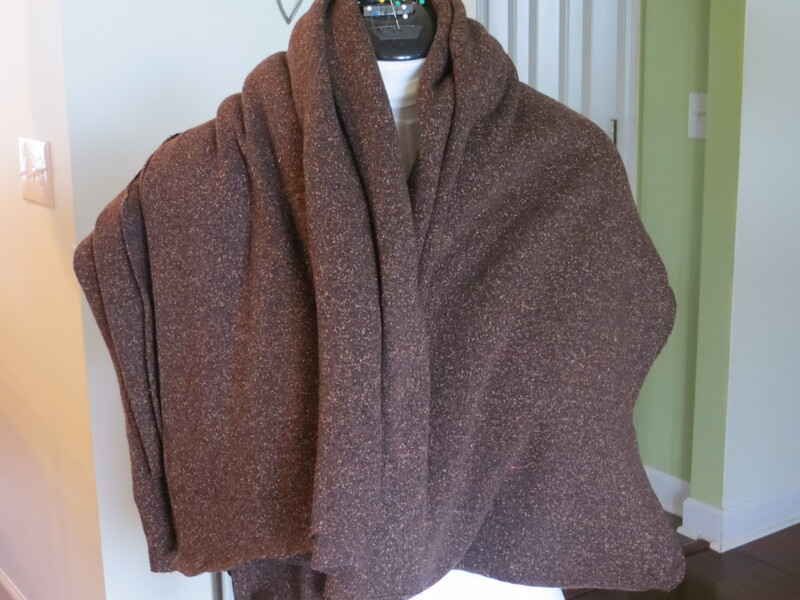 Another favorite — 3 yards of wool knit hoping to be made up into a cowl neck sweater or sweater dress. My two leather hides — one in mint and one in chocolate. Both of these were on the sale rack and cost $25 each. I came out pretty good compared to the ladies who were buying enough hides to make jackets and skirts. I don’t have the guts for something like that yet! We’ll see if these little delicious-smelling babies can whip up into a cute clutch purse or a case for my iPad. 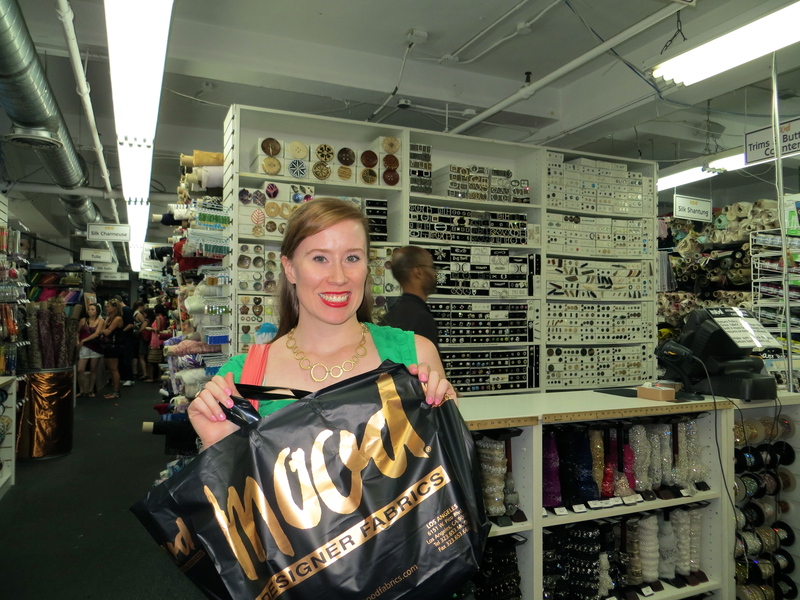 I had a blast visiting NYC and scouring the city for the best fabric I could find. I know it will be years (if ever) before I sew all this up, but I can’t wait to go back again and discover more treasures. I would also love to spend more time seeing more of the sites that the city has to offer. Have you ever been to NYC? 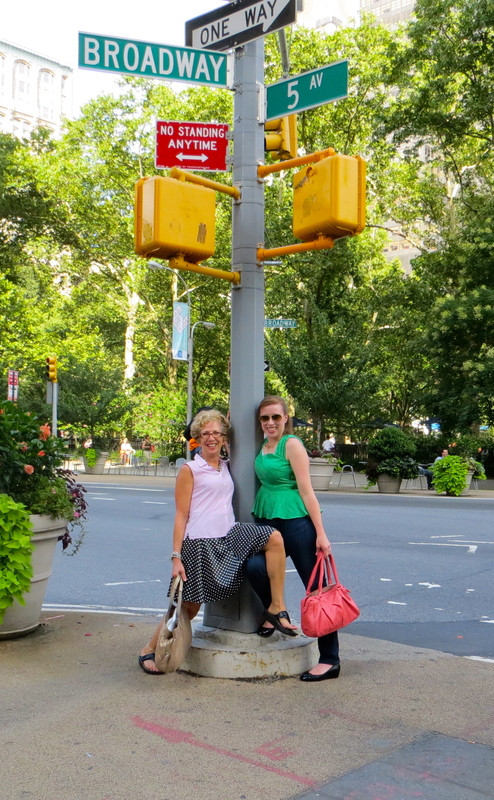 I’d love to hear about your favorite Big Apple experience!